Nail the Look, Vol. 1 by Kylie Clare is a beautiful new nail art book that is fitting to be displayed in your salon’s waiting area. Nail the Look, Vol. 1 by Kylie Clare is a beautiful new nail art book that is fitting to be displayed in your salon’s waiting area. Showcasing some of the hottest trends — such as animal print, matte with glossy touches, and metallics — done by some of the prominent nail artists of the day (including Alisha Botero, Leah Light, and Mirka Poikkeus), the softcover book features a large photo of the nail design on each lefthand page, with a written step-by-step on each righthand page. 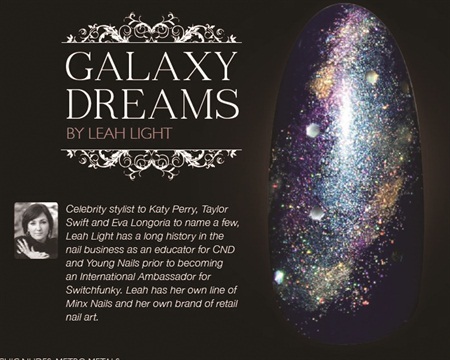 The book was published by Autralia’s SwitchFunky, a nail products distributor. The author is an international educator for Artistic Nail Design, so Clare recommends Artistic Colour Gloss colors for each design within the book (though she adds that these looks can also be achieved using other professional gel-polish or polish lines). Purchase the book at www.nailsmag.com/store.